"...In My Mind I Am Perplexed"
The Civil War transformed American society and institutions. It brought about the formal end of slavery (but not of racial discrimination). It empowered central, national government, and put citizens, particularly those conscripted for battle, in a new relationship to the state. It advanced the reach of industry. But in personal terms, the war’s largest and most lingering effects lay elsewhere. 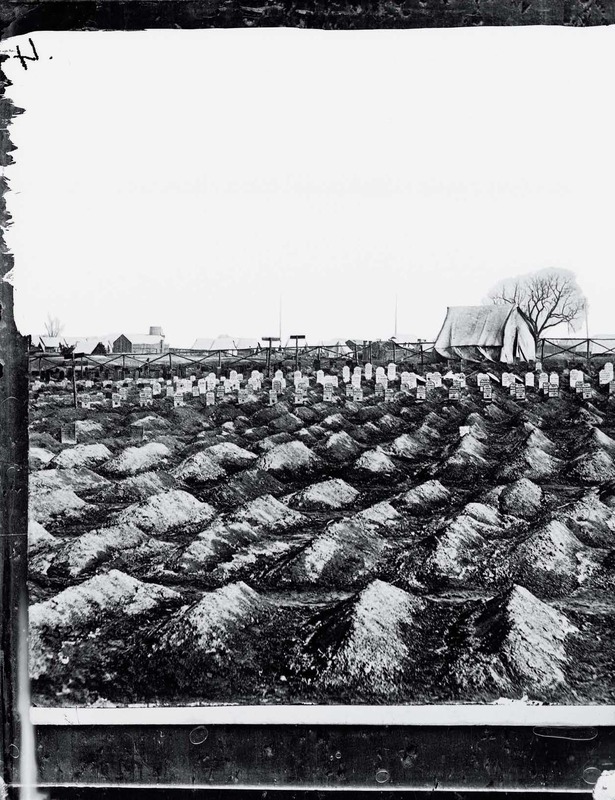 “In the middle of the nineteenth century,” writes Drew Gilpin Faust, “the United States embarked on a new relationship with death” as 620,000 soldiers lost their lives between 1861 and 1865. The scale of the killing—a sum equal to the fatalities in all other American wars from the Revolution through Korea—widowed spouses and orphaned children to an unimaginable degree, particularly in the Confederate states. From sources including letters, newspapers, photographs, official postwar reports of reinterments, and literature, Faust, who is Lincoln professor of history, has made that “work” and its harvest the subject of her new book, This Republic of Suffering: Death and the American Civil War. Based on a decade of scholarship that preceded her arrival as founding dean of the Radcliffe Institute for Advanced Study in 2001 and concluded in the winter weeks just before her appointment as Harvard’s twenty-eighth president last February, the book documents a society transformed. From the war’s bloodshed came government responsibilities for military cemeteries (initially for the Northern dead, at least), for veterans’ pensions, and other institutional changes. The ghastliness of the war impelled a search for meaning, a quest to justify what had been wrought, and challenges to religious faith that mark the beginnings of a modern, skeptical outlook on a newly fearsome and cold cosmos. For all those reasons, this original, unsettling interpretation of the war that did so much to shape America commands attention. That This Republic of Suffering appears during what has now become the nation’s longest war makes it unexpectedly topical, its approach unusually pertinent. That it is dedicated to the author’s father, McGhee Tyson Gilpin (1919-2000), who earned the Silver Star, Purple Heart, and Croix de Guerre as a captain in U.S. Army Intelligence during World War II, underscores as perhaps nothing else the personal nature and meaning of war, even in the twenty-first century. In the aftermath of battle, when the intensity and the frenzy dissipated, when the killing at least temporarily ceased, when reason returned, soldiers confronted the devastation they had created and survived—“the unmistakable evidence,” as one soldier put it after Spotsylvania, “that death is doing its most frightful work.” William Dean Howells later wrote of the lasting impact of the Civil War on James Garfield, a Union general and later U.S. president: “at the sight of these dead men whom other men had killed, something went out of him, the habit of a lifetime, that never came back again: the sense of the sacredness of life and the impossibility of destroying it.” Dead men whom other men had killed: there was the crux of the matter. Battle was, as a North Carolina soldier ruefully put it, “majestic murder.” The carnage was not a natural disaster but a man-made one, the product of human choice and human agency. Neither North nor South had expected the death tolls that Civil War battles produced, and the steadily escalating level of destruction continued to amaze and horrify. The Mexican War had claimed approximately 13,000 U.S. lives, of which fewer than 2,000 had been battle deaths; the First Battle of Bull Run in August 1861 had shocked the nation with its totals of 900 killed and 2,700 wounded. By the following spring at Shiloh, Americans recognized that they had embarked on a new kind of war, as the battle yielded close to 24,000 casualties, including approximately 1,700 dead on each side. Shiloh’s number of killed and wounded exceeded the combined totals of all the major engagements of the war that had preceded it. The summer’s fighting on the Virginia Peninsula would escalate the carnage yet again. “We used to think that the battle of Manassas was a great affair,” Confederate Charles Kerrison wrote home to South Carolina in July 1862, “but it was mere child’s play compared with those in which we have lately been engaged.” By the time of Gettysburg a year later, the Union army alone reported 23,000 casualties, including 3,000 killed; Confederate losses are estimated between 24,000 and 28,000; in some regiments, numbers of killed and wounded approached 90 percent. And by the spring of 1864 Grant’s losses in slightly more than a month approached 50,000. Of all the horrors the horrors of the battlefield are the worst and yet when you are in the midst of them they don’t appal one as it would seem they ought. You are engrossed with the struggle and see one and another go down and say, “there goes poor so-and-so. Will it be my turn next.” Your losses and dangers don’t oppress you ’till afterwards when you sit down quietly to look over the result or go out with details to bury the dead. Witnesses to battle’s butchery often wrote of the impossibility of crossing the field without walking from one end to the other atop the dead. “They paved the earth,” a soldier wrote after the Battle of Williamsburg in 1862. Grant found the same after Shiloh: “I saw an open field…so covered with dead that it would have been possible to walk across the clearing, in any direction, stepping only on dead bodies without a foot touching the ground.” With grim precision Eugene Blackford described a two-acre area at Fredericksburg containing 1,350 dead Yankees; others estimated stretches of a mile or more at Antietam or Shiloh where every step had to be planted on a dead body. Men were revolted both by the dishonor to the slain beneath their feet and by the pollution represented by such distasteful contact with the dead. Like a modern snapshot, this oft-repeated representation of battle’s horror graphically portrayed in the freezeframe of a picture what soldiers could not narrate in a sequence of words. With vividness and detail, for the senses rather than for the reason or intellect, this recurrent image communicated the unspeakable. While many soldiers welcomed this numbing as a means of escaping the horrors around them, others worried about the implications of such detachment. “The fact that many men get so accustomed to the thing, that they can step about among the heaps of dead bodies, many of them their friends and acquaintances[,] without any particular emotion, is the worst of all,” a Federal officer observed. Indifference to suffering and death was “demoralizing,” a failure to care about what should matter most in human life. A religious tract widely distributed in the Confederate army issued a stern “warning to soldiers.” “Guard against unfeeling recklessness,” it cautioned. “By familiarity with scenes of violence and death, soldiers often become apparently indifferent to suffering and anguish, and appear to be destitute of the ordinary sensibilities of our humanity.” Hardening represented in the eyes of the church an abandonment of the compassion that lay at the core of human and Christian identity. Loss of feeling was at base a loss of self—a kind of living death that could make even survivors casualties of war. Killing was the essence of war. But it also challenged men’s most fundamental assumptions about the sanctity of their own and other human lives. Killing produced transformations that were not readily reversible—the living into the dead, most obviously, but the survivors into different men as well, men required to deny, to numb basic human feeling at costs they may have paid for decades after the war ended, as we know twentieth- and twenty-first-century soldiers from Vietnam to Iraq continue to do; men who, like James Garfield, were never quite the same again after seeing fields of slaughtered bodies destroyed by men just like themselves. John Palmer carried the bullet that killed his son with him to the grave; Henry Bowditch habitually wore a watch fob fashioned from his fallen son’s uniform button; Mary Todd Lincoln dressed in mourning till she died; Walt Whitman believed the war had represented the “very centre, circumference, umbilicus” of his life; Ambrose Bierce felt haunted by “visions of the dead and dying”; Jane Mitchell continued to hope for years after Appomattox that her missing son would finally come home; J. M. Taylor was still searching for details of his son’s death three decades after the end of the war; Henry Struble annually laid flowers on the grave that mistakenly bore his name. Civil War Americans lived the rest of their lives with grief and loss. More than 2 percent of the nation’s inhabitants were dead as a direct result of the war—the approximate equivalent of the population in 1860 of the state of Maine, more than the entire population of Arkansas or Connecticut, twice the population of Vermont, more than the whole male population of Georgia or Alabama. These soldiers had experienced what many Americans called “the great change,” the uncharted passage from life to death. No longer fathers or brothers or sons, they had become corpses and memories, in hundreds of thousands of cases without even identifiable graves. Managing Civil War death was made all the more difficult by the mystery that so often surrounded it. Nearly half the dead remained unknown, the fact of their deaths supposed but undocumented, the circumstances of their passage from life entirely unrecorded. Such losses remained in some sense unreal and thus “unrealized,” as the bereaved described them, recognizing the inhibition of mourning that such uncertainty imposed. The living searched in anxiety and even “phrensy” to provide endings for life narratives that stood incomplete, their meanings undefined. This crisis of knowledge and understanding extended well beyond the problem of the unidentified dead to challenge, in Melville’s words, “the very basis of things.” Individuals found themselves in a new and different moral universe, one in which unimaginable destruction had become daily experience. Where did God belong in such a world? How could a benevolent deity countenance such cruelty and such suffering? Doubt threatened to overpower faith—faith in the Christian narrative of a compassionate divinity and a hope of life beyond the grave, faith in the intelligibility and purpose of life on Earth. Language seemed powerless to explain, humans unable to comprehend what their deaths—and thus their lives—could mean. The nation was a survivor, too, transformed by its encounter with death, obligated by the sacrifices of its dead. The war’s staggering human cost demanded a new sense of national destiny, one designed to ensure that lives had been sacrificed for appropriately lofty ends. So much suffering had to have transcendent purpose, a “sacred significance,” as Frederick Douglass had insisted in the middle of the war. For him, such purpose was freedom, but this would prove an unrealized ideal in a nation unwilling to guarantee the equal citizenship on which true liberty must rest. Slavery had divided the nation, but assumptions of racial hierarchy would unite whites North and South in a century-long abandonment of the emancipationist legacy. Instead, the United States’ new and elevated destiny became bound up with the nation itself: its growing power, its wealth, its extent, its influence. Debates about nationalism had caused the war; national might had won the war; an expanded nation-state with new powers and duties emerged from war’s demands. And both the unity and responsibilities of this transformed nation were closely tied to its Civil War Dead. The meaning of the war had come to inhere in its cost. The nation’s value and importance were both derived from and proved by the human price paid for its survival. This equation cast the nation in debt in ways that would be transformative, for executing its obligations to the dead and their mourners required a vast expansion of the federal budget and bureaucracy and a reconceptualization of the government’s role. National cemeteries, pensions, and records that preserved names and identities involved a dramatically new understanding of the relationship of the citizen and the state. Edmund Whitman had observed with pride after his years living among the dead that the reinterment program represented a national commitment to a “sentiment.” In acknowledging that decent burial and identifiable graves warranted such effort and expense, the United States affirmed its belief in values that extended beyond the merely material and instrumental. Soldiers were not, as Melville articulated and so many Americans feared, “operatives,” simply cogs in a machinery of increasingly industrialized warfare. Citizens were selves—bodies and names that lived beyond their own deaths, individuals who were the literal lifeblood of the nation. Without agendas, without politics, the Dead became what their survivors chose to make them. For a time they served as the repository of continuing hostility between North and South, but by the end of the century the Dead had become the vehicle for a unifying national project of memorialization. Civil War death and the Civil War Dead belonged to the whole nation. The Dead became the focus of an imagined national community for the reunited states, a constituency all could willingly serve—“the dead, the dead, the dead—our dead—or South or North, ours all (all, all, all, finally dear to me),” Walt Whitman chanted. In 1898 President William McKinley announced to the South, in a much-heralded speech in Atlanta, that “the time has now come in the evolution of sentiment and feeling under the providence of God, when in the spirit of fraternity we should share with you in the care of the graves of the Confederate soldiers.” The sons and grandsons of “these heroic dead” had in the preceding year risked their lives in a new American war; the brave Confederates should be officially honored alongside their Union counterparts. Of widows’ and of orphans’ tears. May God forgive him, I shall not. And Oliver Wendell Holmes, who had as a young soldier facing death so resolutely rejected the solace of Christianity, came to embrace war’s sacrifice as the one foundation for truth. His “Soldier’s Faith” speech, delivered on Memorial Day 1895, became emblematic of the elegiac view of the war that hailed death as an end in itself. “I do not know the meaning of the universe,” Holmes baldly declared. “But in the midst of doubt, in the collapse of creeds,” he had found one certainty: “that the faith is true and adorable which leads a soldier to throw away his life in obedience to a blindly accepted duty, in a cause which he little understands, in a plan of campaign of which he has no notion, under tactics of which he does not see the use.” The very purposelessness of sacrifice created its purpose. In a world in which “commerce is the great power” and the “man of wealth” the great hero, the disinterestedness and selflessness of the soldier represented the highest ideal of a faith that depended on the actions not of God but of man. “War, when you are at it,” Holmes admitted, “is horrible and dull. It is only when time has passed that you see that its message was divine.” War may have shattered the young Holmes’s beliefs, but for the old man, war became the place where man’s confrontation with annihilation had made him “capable of miracle, able to lift himself by the might of his own soul.” Man’s ability to choose death became for both Holmes and Bierce the most important experience and memory of the war. We still live in the world of death the Civil War created. We take for granted the obligation of the state to account for the lives it claims in its service. The absence of next-of-kin notification, of graves registration procedures, of official provision for decent burial all seem to us unimaginable, even barbaric. The Civil War ended this neglect and established policies that led to today’s commitment to identify and return every soldier killed in the line of duty. But even as the Civil War brought new humanity—new attentiveness to “sentiment”—in the management of death, so too it introduced a level of carnage that foreshadowed the wars of the century to come. Even as individuals and their fates assumed new significance, so those individuals threatened to disappear into the bureaucracy and mass slaughter of modern warfare. We still struggle to understand how to preserve our humanity and our selves within such a world. We still seek to use our deaths to create meaning where we are not sure any exists. The Civil War generation glimpsed the fear that still defines us—the sense that death is the only end. We still work to live with the riddle that they—the Civil War dead and their survivors alike—had to solve so long ago.